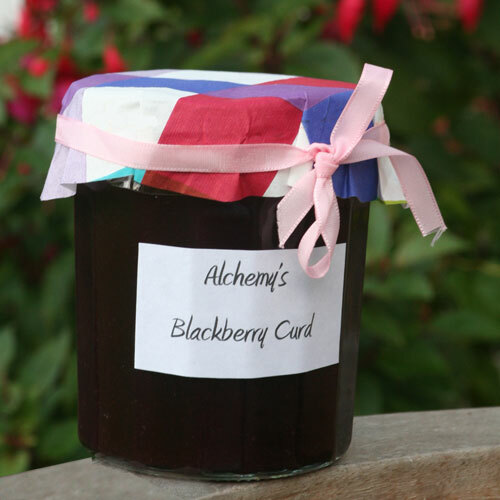 Alchemy in the Kitchen: Blackberry Curd – I’m Wild About It! Blackberry Curd – I’m Wild About It! Pin It Blackberry season is nearly over and I am making the most of the remaining wild berries. I've made jam, and the cordial has proved really popular with my family who are using it to make everything from blackberry bellinis and mojitos to pancake syrup and the mystery ingredient in a berry compôte. One of my favourite ingredients for a versatile dessert is curd. I love lemon curd, but I’m always happy to experiment. Here’s my latest curd creation. 1 Place all the ingredients together in a medium saucepan and heat gently over a low heat, stirring all the while. Continue stirring for about 25 minutes until the mixture thickens. Don’t be tempted to leave it even for a moment unless you want blackberry-flavoured scrambled eggs. To check if it is ready, dunk a spoon in the mixture then draw a finger through the mixture that adheres to the spoon. The channel you make should remain. If no channel remains, continue cooking for a further five minutes and test again. It will thicken further as it sets. 2 Pass the mixture through a sieve to ensure it is totally smooth before transferring to a sterilised jar. Cover when cool and store in the fridge for up to 3 weeks. I fold this mixture into whipped cream and use it to fill mini-pavlovas. It is also fantastic used to sandwich a simple Victoria sponge, or to fill a pastry shell. Top with mixed berries. Oh, how I'd love a jar of your curd...it looks fabulous! As does that mouthwatering pavlova...YUM!!! Oh yummy, I am salivating just thinking about it. 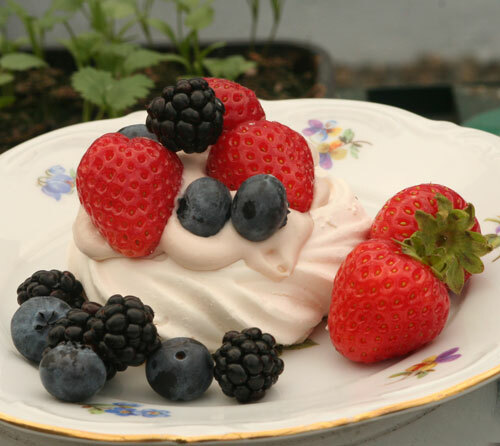 Especially in a pavlova with more fresh berries. mmmm! I've never made curd of any kind but that might be the next step in my preserving undertakings. You're so lucky to have access to wild blackberries! Dare I say that we could also fill our macarons with this delicious curd? Hester what a great curd, so original! I’ve just made a jar of lemon curd and will need to eat it first before I can start experimenting. Your pavlova looks just a like a party on a plate! I just might be the one who made blackberry flavored eggs! This curd does sound unique . And doesn't sound that hard either. Think I could make it with blueberries? I want one of these jars shipped forthwith LOL now this is the kind of thing I "accidently" put behind things so others are unlikely to find it. I love lemon curd but have never tried (or even heard of) this magical blackberry curd. If there are any berries left I am going to try this recipe Hester. It sounds so good. I can almost feel the texture of it! How I would love one of those jars! There is so much you can do with berry curd when it comes to desserts. You picked a delicious way to showcase them-yum! This blackberry curd is really something to be tried out! So healthy!! I'd never even considered making blackberry curd. You've inspired me! So yummy and berry delicious! @ Rachel, yes very lucky to have a whole field of them opposite my house. So many blackberries, so little time. @ Rosemary - lovely idea - worth experimenting - let me know how it turns out. @ Mike and Parsley Sage - if I thought it would make the journey without exploding... PS how about some Mango Curd? I'm a big fan of lemon curd, & blackberry curd sounds incredible!! It's so versatile, but I'm guilty of eating it with only a spoon! Your blackberry curd is absolutely divine! Especially stirred into cream! I wish it was my breakfast. oh wow!!! your blog is very interesting!!! and your recipes are very yummy!!! Just love, as always, Hester! I have yet to attempt a curd, but you are pushing me over the edge. It just looks so fresh and creamy when you add it to the double cream. Bravo on another well-deserved Top 9! Great job as always Hester and the jar looks so pretty!! I make the traditional lemon curd and other citrus curds, but have never even thought of doing a blackberry. Our blackberry season has LONG gone (So. MS), but we have blueberries out the wazoo (put up ofcourse...about everyway you can think of) I think I'll simmer a few, reduce down and follow your recipe. It should make some AWESOME blueberry curd. Thanks for the inspiration!!!! Ooooh wow! I just discovered lemon curd this year, but blackberry curd - how awesome is that! Congrats on Top 9! Sooo well deserved - this is an awesome and original take on curd. And that pavlova is adorable! yammmmi! I'm going to be mad to test the Blackberry Curd. Thanks for the nice recipe…. I adore jams. I think I am equally wild about this one! Beautiful work Hester. Happy "Arthur’s Day" - A Stroke of Guinness!